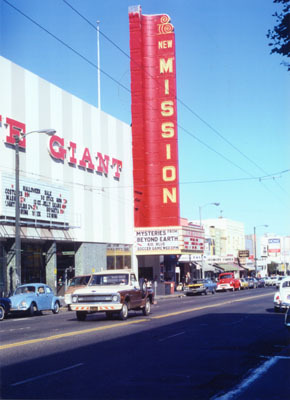 Looks like Medjool’s Gus Murard has been falling behind on payments for the dilapidated New Mission Theater and GIANT VALUE building and is possibly facing foreclosure from the City College of San Francisco Board of Trustees. According to the article, Murard planned to eventually convert the site to “affordable housing”. If this is true, he’ll totally save money on signage by just slapping “APARTMENTS” under “GIANT VALUE”. Get the full scoop at the über-1337 M!$$!0n L0c@l.
Because this place used to be a movie theater, it must stand forever. Yes, it’s vacant, rotting, and a blight on the neighborhood, but it used to be a movie theater, dammit, so it must stay. Mission Loco always has a slant, so no thanks to the suggestion. That theatre is gorgeous inside and out, it would be so nice to see it restored, preferably as a live-music venue on the model of the Fox in Oakland.